You are not logged in. [Log In] Pond Boss » Forums » GENERAL QUESTIONS » Wildlife Management » Snakes Already!!! #465223 - 02/27/17 03:48 PM Snakes Already!!! With our abnormally warm spurts of weather lately snakes have been seen here in Missouri. May I ask what a chicken snake is? Is that like some people calling perch a red fin pike? 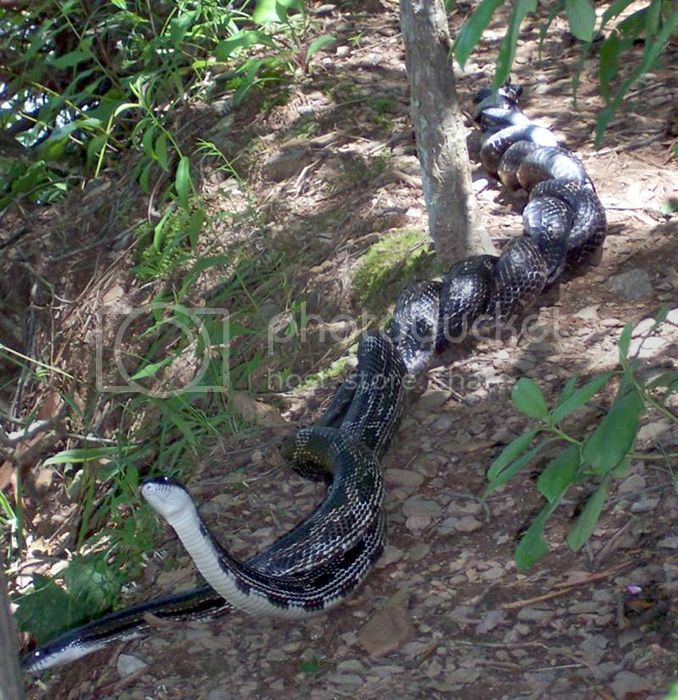 I was doing image search for chicken snake and google went crazy showing hundreds of different snakes under that search? Some people call them rat snakes. They aren't venomous, but they will bite you! They steal egg, hence the name chicken snake. I was moving a pile of scrap lumber covered by a tarp yesterday and killed a small one (~2 1/2' lg). Stomped him. It's head was angular in shape. Not sure what species it was....but, now he's the best species...."dead snake." Very sad that a symbolic Bible story has been responsible for so many snake killings. somebody told me last week that rattle snakes in these parts are more and more not rattling when approached because it alerts hogs that approach them and the hogs kill them....if that is true....it's kind of a bummer since the rattling alerts humans in time to keep from getting bit. but maybe it's not true? If a hog get bit while killing a rattler, is its bacon poisonous? If I can tell its a nonpoisonous snake and I can move it away from the cabin area, it is left alone, but if I can't tell or it will not leave, or is not nice, it is gone. I guess I still have snakes but seldom see them. If it's true that hogs eat them, I have no snakes left. I'm loaded with hogs. Kids are heading there this weekend to thin them. I can't believe a rattlesnake is laying there "thinking" oh, here comes a hog! Shhhhhh! He might eat me! I saw my first snake at the pond day before yesterday. My toy Maultiepoo dog Charlie, actually smelled it first. Snake was on a steep bank at the waters edge and I barley got a glimpse of it as it entered the water. Dark gray color makes me think Moc, but could have been what I call a yellow belly water snake. In ether case, I do not allow Any snake at or in the pond. If the snake stays, his days are numbered. Pat, I ran minnow trap yesterday and if a snake would have come up with that trap, I would have lost the trap to the pond, Thrown up and out as I departed the seen. We've seen a bunch of snakes out already. Every body of water. Rat snakes, queen snakes, brown water snakes, marsh snakes, and copperheads. 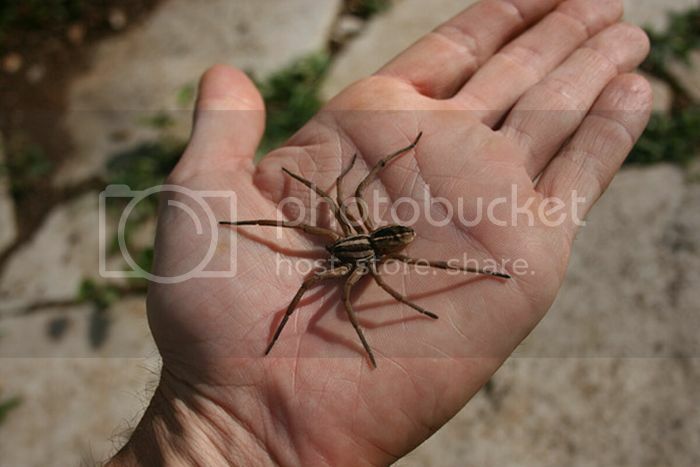 And even some spiders, too. Tracy, did that snakes body stay on top the water? If it did chances are it was a moc. Lot of water snakes all you see is the head. But they all freak me out!! Flame he pretty much disappeared as soon as he entered the water, so I am guessing he went under. I don't like snakes around my little Charlie, he is so small a snake bite is a no no. Heartbreak and most likely a divorce would soon follow. I've been worried about my little one. She runs in front of me and loves to go to the pond anytime I go. My wife says they have snake shots to protect them. I told her to ask vet about pro's and con's. As soon as I hear something, I'll give you a shout. We go down to the pond several times a day and my little dog is so small, it wouldn't take much venom to kill her. Agreed, Pat...I have caught several (drowned) in my minnow traps last year....turtle food! My wife says they have snake shots to protect them. I told her to ask vet about pro's and con's. Like yours farmallsc my Charlie is about 5 lbs and loves the pond, he gets in the water every time we go. He once swam out to a duck decoy, swam around it 3 times and then returned. He loves the water. Maybe it's the poodle part in him that makes him a water dog I worry more of the Moc's, they have a mean attitude, way more aggressive than a copperhead or rattler. I wonder how the wild temperature swings we have been having will affect the snakes? 70 to 80 degrees one day and low of 22 two days later.